Open End, a new music and improvisation ensemble featuring Andrew Waggoner and Caroline Stinson, faculty members in the Rose, Jules R. and Stanford S. Setnor School of Music in Syracuse University’s College of Visual and Performing Arts (VPA), will perform on Thursday, Oct. 20, at 8 p.m. in the Rose and Jules R. Setnor Auditorium, Crouse College. The concert is free and open to the public. Free parking is available in the Irving Garage; patrons should mention that they are attending the concert. The program will feature works by Olivier Messiaen, Charles Ives, Elliott Carter, Waggoner and Shulamit Ran, as well as a new work commissioned by Open End from young American composer Jesse Benjamin Jones. Based in New York City and Seattle, Open End specializes in contemporary works, modern classics and free improvisations, done in the moment without planning or preparation. 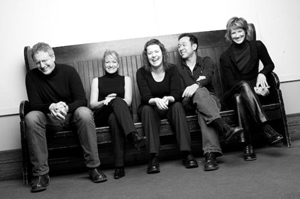 Called “unusually adept contemporary music specialists” by the New Yorker and “remarkable musicians” displaying “vibrant lyricism” and “rare refinement” by Les Dernières Nouvelles d’Alsace in Strasbourg, France, Open End has played in recent seasons in New York, Minneapolis, New Orleans and Strasbourg. For more information about Open End, visit http://openendensemble.com. For Setnor Auditorium concert status updates, contact the Setnor School at (315) 443-2191.